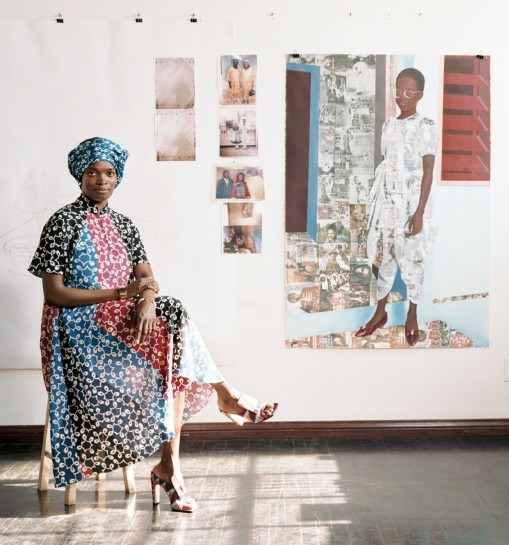 Nigerian Artist Njideka Akunyili Crosby Is Painting the Afropolitan Story in America. The artist Njideka Akunyili Crosby was 16 when she left her native Nigeria to study in the United States in 1999. Having grown up in the city of Enugu, she went on to earn degrees from ­Swarthmore ­College and Yale, after completing post-bac studies at the ­Pennsylvania Academy of the Fine Arts. As a young African immigrant, she learned to straddle the divides between black and white, African and American, local and foreign, while negotiating her own identity between worlds. And yet, she recalls, she had experienced much greater culture shock when she moved from her home in southeastern Nigeria to Lagos, where at the age of 10 she was accepted into one of the country’s most prestigious girls’ boarding schools. There she discovered a pulsing, cosmopolitan city, and met, for the first time, girls from wealthy families who had the means to travel for leisure. These “bobblers,” she remembers, often returned from school holidays with the latest Disney merch and accounts of the American TV shows they had watched overseas. A favorite at the time was Friends, which the bobblers would recap, scene by scene. “We’d watch it through their storytelling,” Akunyili Crosby told me one humid afternoon this past April, sitting in her kitchen in Los Angeles. “And then, when I’d go home, I’d narrate each episode for my family so they could watch it, too.” When she finally arrived in the U.S. and actually saw Friends for the first time, she thought to herself, I’ve seen this episode, but very differently, because I was imagining it.